Tickets are on sale for "Once on this Island"! Tickets are now on sale for "Once on this Island"! Click the ticket icon on the left to get your tickets now for our summer musical! Show dates are June 1-3 and 8-10 (8 PM) and June 4 and 11 (2 PM matinee). All seats are $15 and can be purchased online or at the door. We will be having a board meeting at 6:00P.M. on Monday, April 3. Some topics up for discussion are proposed Playhouse events and discussion of purchasing an electronic billboard. 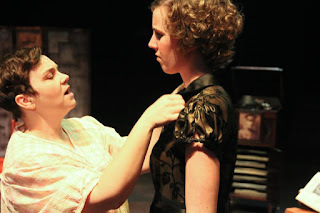 Glass Menagerie Encore Performance Tonight! Get yourself all dolled up and head down to the Playhouse tonight for a reception and special ONE NIGHT ONLY encore presentation of The Glass Menagerie. Tickets are just $10 and proceeds will go to help get the cast and crew to Lafayette, LA next week to represent NM at the AACTFest regional competition! "The Glass Menagerie" competed at the Theatre New Mexico AACTFest 2017, and was selected to advance to regionals! The Glass Menagerie won the following awards at the AACTFest State level: Outstanding Costume Design, Outstanding Performance in a Supporting Role (Sarah Bunch), Outstanding Ensemble Performance, and Advanced to Regional Competition. Please join us for a pre-show reception recognizing these accomplishments and help us send off the cast and crew to regionals with the best of wishes. Light refreshments will be served. Front of house will open at 8:00 pm.